It is now true. 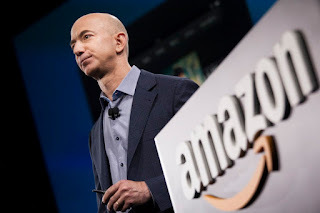 Jeff Bezos, the CEO of Amazon surpassed Warren Buffett and became the world's second richest person. As CNN reports, "The latest tally by Bloomberg's Billionaires Index shows Bezos is now worth about $75.6 billion. Another ranking compiled by Forbes has Bezos' value at "just" $75.2 billion. Date : 3/30/2017 02:15:00 μ.μ.